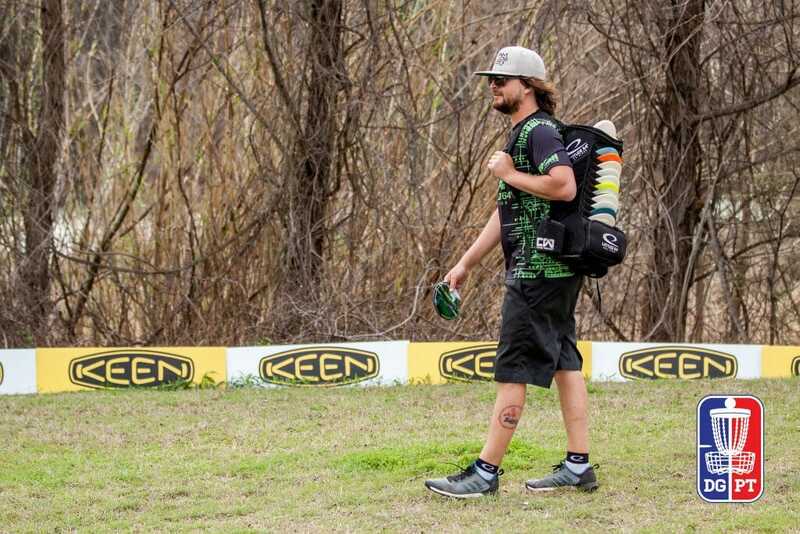 In the lead up to the Waco Annual Charity Open, the second Disc Golf Pro Tour event of the season, we wondered if certain early season trends would continue in Texas. With Devan Owens in the lead, it would appear we’re in for another event that won’t end in a Paul McBeth, Ricky Wysocki showdown. Owens carded one of two bogey-free rounds in the 108 player Open field, finishing at 11-under par 56. 2017 WACO champion Jeremy Koling, and McBeth are tied in second place at 10-under par 57. Gregg Barsby, Emerson Keith, Drew Gibson, Nate Perkins and Joel Freeman are all tied in fourth place at 9-under par 58. Owens’ 1052-rated opening salvo featured long runs of birdies; he collected four in a row on the wooded back nine, then seven in a row, as he transitioned from the woods to the more open front nine, from holes 16 through 4. Throughout those long birdie streaks, the Oklahoman made it easy on himself on the green, by routinely putting it close, reaching circle 1 in regulation, according to UDisc Live’s statistics, on 61-percent of the holes. He only had to putt for birdie from 16 feet and in, only missed one putt from circle 1 all day, and in the one instance that he did not reach circle 1 in regulation but still birdied, he hit a 75-footer on the 462-foot par 4 13th. Remarkably, despite the lead, Owens leads the field in just two statistical categories UDisc Live tracks — scramble rate, and circle 1 putting — and doesn’t appear in the top 10 of any other category besides birdie percentage. In contrast to Owens consistent, McBeth, and Koling each had more ups and downs on the way to their second place scores. Each competitor racked up birdies and avoided bogies on the front nine, reaching circle 1 in regulation with ease and scrambling for par on a few occasions. Koling found trouble first on the tightly wooded 591-foot par 4 16th when he missed the fairway, his scramble attempt, and a circle 1 putt to save par. He followed up that bogey by hitting a 38-foot birdie putt on the 279-foot par 3 17th and connecting on an eagle on the treacherous 609-foot par 5 18th. Two OB strokes on holes 3 and 5 did not allow him to finish out the round on an extended birdie run, however. Like Koling, McBeth found some trouble before leaving the wooded back nine, three-putting on the par 3 17th for bogey, but quickly rebounded, getting an eagle on 18 after reaching 16 feet with a clean approach shot. After an OB stroke on hole 2 resulted in a bogey, McBeth finished out the day with four consecutive birdies. In total, his putting was greatly improved from circle 1, at 90-percent. This, compared to what we saw at The Memorial, where he only hit 90-percent or better once during the four-round event. Further down the leaderboard, two players who looked to be locked into the top 10 with just a few holes remaining in round one were James Conrad and Nate Sexton, who are currently tied in 15th place at 6-under par 61. Through the first 16 holes of their respective rounds, neither had recorded a hole over par and were sitting at 9-under par and 8-under par respectively. But the difficult final two holes bit both players. Conrad’s backhand drive on the 610-foot par 4 5th — statistically the most difficult hole on the course — faded out early and left, over the OB sidewalk. His attempt to reach the peninsula green from there hit an early tree, and his second attempt also caught some branches late. After reaching circle one, he missed his attempt at a double-bogey save low of the basket and had to settle for a triple bogey seven. Sexton found his trouble on the final hole, the 492-foot par 4 6th, which played as the third most difficult hole in the opening round. Sexton’s drive went OB, and his scramble failed to give him a look at par. After missed putts from circle 2 and circle 1, he was settling for a double-bogey six. Should both competitors avoid similar mistakes, and maintain the consistent form they showed earlier in round one, look for both to make to move up the leaderboard in today’s round. The lead card of Owens, McBeth, Koling, and Barsby tees off at 3:15 p.m. local time. For those of you following along at home, the live broadcast of the round two lead card begins at 4:00 p.m. eastern time on the Disc Golf Pro Tour YouTube channel, and you can follow along with live scoring from the entire field on UDisc Live. Comments on "Owens Outpaces WACO Field In Opening Round"